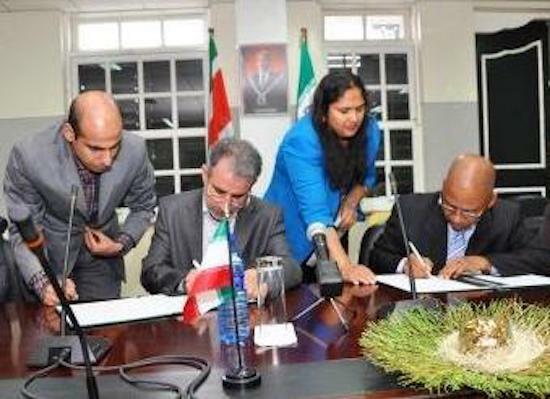 Visiting Iranian Deputy Minister, Amir Mansour Borgehei and his Surinamese counterpart, Winston Lackin signed a memorandum of understanding between the two countries yesterday in Paramaribo. The MOU allows both both countries to build mutual ties of friendship with the emphasis on economic cooperation. At the signing ceremony was Vice President of Suriname, Robert Ameerali, signaling Paramaribo’s seriousness in forging economic ties with Iran. During his visit to Suriname, Borgehei presented a grant of U.S. $ 1.2 million for purchase of tractors for the agricultural sector of Suriname. The Iranian Deputy Foreign Minister is in the region to also invite the Surinamese and Guyanese Presidents to the 16th Non-Aligned Summit (NAM) to be help in Iran between August 26th and August 31st 2012. In June President Desi Bouterse held bilateral meeting in Managua, Nicaragua; with the Iranian leader Mahmoud Ahmadinejad. The meeting took place at the sidelines of the inauguration of Daniel Ortega, Head of State of Nicaragua. Bouterse said that his country was determined to promote good relations with all developing countries, including Iran. Suriname and Iran established diplomatic relations in 1997. They identified areas of cooperation in agriculture, education, exchange of agricultural technology and promoting the agricultural industry (export opportunities for the Surinamese rice into the Iranian market). At multilateral level, both countries work together in international organizations such as the Organization of Islamic Cooperation (OIC), the Non- Aligned Movement (NAM), the Islamic Development Bank (IsDB) and the United Nations (UN). Be the first to comment on "Suriname receives USD 1.2m grant from Iran"
Will I go to Paradise if I should follow the ways of Father Abraham?